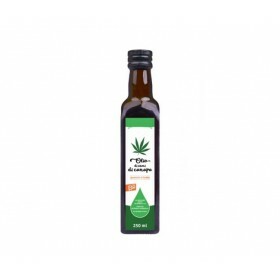 Hemp seed oil is a high quality cold pressed oil from the hemp seeds. It has all the health benefits and nutritional values of hemp seeds - unsaturated acids, rare proteins, vitamins and minerals. It is also a great source of nourishment for the brain and is an excellent alternative to fish fat. Suitable for the development of a child, protects the heart and nervous system. Cannabis oil is delicious especially on cold dishes - salads, pasta or simply on a piece of bread.